Welcome one and all to part three of my month torturing my Mom into boasting to us about herself. We had a question...Did she see her shadow? Can YOU see a shadow? If you haven't read parts one and two, scroll down to the last two postings here. I've been telling one and all for years Mom is warped. When we concluded the last posting I suggested Mom give us all the titles of her books and short synopsis of each. I'm not going to repeat what Mom said to me...you all think because she has this little girl's voice, a dark word wouldn't dare pass her little lips...Trust me, Mom doesn't use them often, but when she does, she lets loose with a string of words her Grandmother would have made her wash her mouth out over. Like you'd let me not be here. Our apartment is too small and has too few places for me to hide from you. Every time I try, you turn into a blood hound and ferret me out. So yeah, I'm here! Good. Are you ready to tell us about your books? I guess. 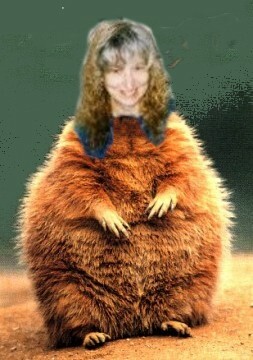 Keep in mind you demanded this of me. The first book I got published here at Muse or anywhere else for that matter, is Santa is a Lady. It's a story about two best friends. One owns a sweets store and it is less than a week before Christmas...crunch time for retail business. Beck's store also hosts Santa and his throne so all the children of Northeringale can come and sit on Santa's lap with their last minute wishes. But last night, Santa was arrested. Beck scrambles to find a replacement, but all the graduates from Santa School are working elsewhere. There isn't a Santa to be had. So Beck strong arms her best friend Angie Brightwell into donning the jolly man's suit. Into this mix we ad Cameron Drayton. He only JUST got his daughter from the evil hands of her Iraqi uncles and the orphanage they placed her in until Cam could come up with the money to ransom her back. He has a dream...give his precious child the "perfect" Christmas, but a female Santa doesn't fit into that equation. You also included a cat and an indoor snowstorm in this story, didn't you? Mama Bear. I had to give her an opportunity to slip slide across the kitchen floor...an indoor storm courtesy of some vigorous cookie baking with flour and powdered sugar flying everywhere gave Mama Bear her winter wonderland...indoors. 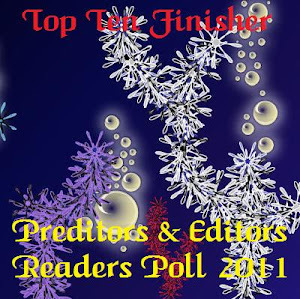 Santa is a Lady released on December 1, 2010 and in less than six weeks took 5th place in the 2010 Preditors and Editors Reader's Poll. What did that feel like? I to this day don't know how it got nominated. Santa is a Lady was submitted to Muse It Up Publishing on March 28th, 2010. Five hours later I received my contract for it. So this story has been charmed since the beginning. I nearly fell out of my seat when the contract came, and I pretty much did the same thing when it won the P&E award. Times Best Selling author, Glenn Kleier, and in his review he said he can't imagine how I could top this first book. It's such a high to hear from people who've read it and loved it, and that more than anything is what I cherish about writing. I've always loved reading. To me, authors are the REAL celebrities, and now I'm one of them...along with you, My Kitty-Kat. Sharing this experience with you is a miracle. Awww, you're gonna make me blush. You badgered me into subbing my books. So whatever success I have, you made it happen. Not true, but we won't belabor that point. Your next book is really short. It also has one of your best covers too, also done by Delilah K. Stephans. tell us about it. You are soooo right. Delilah has done all but one of my covers so far, and the woman just constantly hits the nail on the head. Coming to Muse has given me so many blessings; Lea our incomparable Publisher and her partner, the deceptively quiet Litsa, Delilah, my editors, those I've worked with and those I value for their friendship and never ending love and support. Covers are the initial lure for a book, and Delilah NEVER lets me down. Ma, you're doing it again. This is supposed to be about YOU. Lea, Litsa, Delilah, and your editors all know how highly you think of them, but this is supposed to be you boasting about you! Hmmm I hoped I could slip that past you without you noticing. Alright, alright, alright. Book Two came out in February 2011. Forever With You is a sensual mystery. Coryne, a lawyer, is having a one-of-a-kind mountain home built by Keith and his construction crew. The sparks between Coryne and Keith are intense, but Coryne resists, right up till the surprise ending. It released from the Muse It Hot side of Muse because it's got fire licking through it. In March 2011, another of my books released from the Muse It Hot side...my first Jimmy Thomas cover. Now I have to be honest, I didn't have a clue who Jimmy Thomas was. You had to tell me and then let me know you were jealous of me getting Jimmy first. This is a Time Travel, sort of story. Siri wakes up in a hospital room, and has no idea who she is. The man who comes to visit her seems to hate her and claims he's her husband. After he leaves, snippets of her life as Siri, not the Joanna that man called her, return. Moments ago she lived in ancient Rome as Siri, now she's here in the 21st century, inhabiting the body of a woman everyone seems to loathe. What is a misplaced Egyptian slave to the Roman Empire supposed to do in this modern time with everybody treating her like they hate her? I did an interview with a character from that book last year too. I'm sure there are readers here now that did not see that posting. Tell them about it. You're talking about the fireplace right? In the den of the home Siri's Joanna owns is a really randy fireplace who has a crush on Joanna's husband. You went out to their house and gave an in depth interview with the fireplace. Anyone who wants to read it, here's the direct link. It's a good one. THE TALKING FIREPLACE INTERVIEW. That brings us up to three of my books. Are you sure you want me to do ALL of them? How many do you have out and available right now? All of them are with Muse It Up Publishing. I'm too lazy to sub to other houses, plus I really love being here. 1. Santa is a Lady: from the Muse It Up (MIU) side. I also have She's Gone coming out this month, February 2012, with this cover done by another one of our Cover Artists, Nika Dixon. That's a LOT of books in your first year. Back when I was in college, I took a Creative Writing class...three hours on Tuesday nights. After leaving class, with the assignment for the following week in my head, Nudge would make me drive with one hand on the wheel, a pad of paper beside me and the pen zipping across in really bad scribble the whole way home. Luckily I drove back roads through the farm country with no other traffic at that hour of the night. I tried ignoring Nudge, so I could drive with care, but Nudge is a relentless, and determined task master. When she's got a story percolating, short of shooting myself, a rather drastic Nudgitis cure, she has her way. That reminds me...tell my readers about my favorite story you wrote during your college years. I wish we still had it! I know. I know you do. I'm really sorry we lost it in all the moves, but I wrote that back when Commodore 64's were the only computers for homes and I lost the big floppy, not that I could transfer it today anyway. The story...our assignment was to write a play based on current headlining news. Simple right? Not with my sense of the bizarre! Humana Hospital had just created the first artificial heart. You, My Love, are a great fan of the Three Stooges. So in your honor, I wrote a play with them as doctors, under the direction of Dr. Thumper and Nurse Beat. Dr. Moe, Dr. Larry, and Dr. Curly invent the REAL first artificial heart, using a tin can and a rubber squeeze bulb on the end of plastic tubing. I was part of a four student team. We actually had to write a play and put it on. I wrote, and narrated...they acted. We all got an A+ for that play. You DO know you have a twisted sense of humor, don't you? So you keep telling me. Do you want me to continue giving synopsis...what's the plural of synopsis?...of my books? In the first two posting for this month, you gave us some clues about Twilight Comes, and The Christmas War. That brings us to five of your books so far. I know Beyond Yesterday has your number one favorite cover. Tell us about that story. What inspired you to write it? Delilah gave me an incredible cover for this book...No people. This is a story that could have gone either way. Twilight Comes does not have a happy ending; there was just no way that one could. Beyond Yesterday covers an equally dark topic, and the cover reflects it so well; the story is all there. Pamela sees the video Reba MacEntire does for her song Fanny. It haunts her because of how close to her own past it is. Drawn to visit her place of horror she enters the tar paper shack at the very front edge of her grandparents mansion estate. Both buildings show the signs of neglect and emptiness. Returning to that shack where her grandparents forced their son and his young family to live, is more than hard, but nothing compared to a wind that refuses to let her leave before entering the mansion she'd been refused entry to all her young life. There we learn why. She deserved a happy ending. So although the topic is dark, she radiated an aura that Nudge and I had to honor. It made me cry when I read it. Thanks. That's nice to have you say here. Mom, I want to thank you again for stepping in and sharing all these bits and pieces about the you, you really don't like to brag about. We have at LEAST one more posting to do. Once upon a time you fell head over heels in love and had a lot of strange things happen. Will you tell us about it next time? Many know the hell you've walked through. Telling this part of your life's story will let them know why you have such a generous heart despite that cruelty. <gulping> You want me to talk about JJ? Sweetheart, JJ is not the only reason I am who and what I am. YOU, My Beloved Miracle have shaped the mother, and the woman I am today. JJ helped. And so did the ladybugs. I can't promise, but if I can't share that part of me, I will come up with something for our last one, maybe two postings this month. Again Mom, thank you. You never let me down. I know you will come up with something fantastic either way. 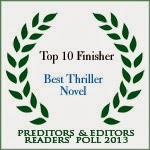 To my readers, thanks for helping L.J. (Mom) Holmes and me LEAP through this February journey. For Now Good Night Mom, and yeah you can sleep in your own bed tonight, not on your keyboard. People are starting to talk! Good job, Kat! At least she pays attention to somebody when we try to get her to take the limelight! You gals have a very special relationship. Happy Valentine's Day! !